Early civilizations relied on storage pits rather than large structures to protect seeds and surplus food. Some later storage facilities, like Roman horreum, were rectangular buildings built of stone, with a raised ground floor and an overhanging roof to keep the walls cool and dry. 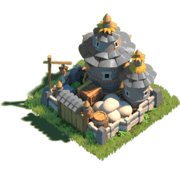 Storehouse is one of the first buildings players have to build in Rise of Kingdoms. The Storehouse helps you protect your resource from the attackers. All of the resources protected by the Storehouse will not be taken by any attacker. By upgrading the Storehouse, you can increase the cap of the resources you can protect.